It’s been estimated that as many as nine out of 10 manufacturing activities are service- or information-related. When the figure reaches 10 out of 10, one has no physical product at all, apart from the information itself. Reuters Holdings, the U.K.-based international business information and news organization, is among those closest to being an archetypal pure information enterprise. Rival Dow Jones, which publishes The Wall Street Journal, at least generates a product at once familiar to the eye and something one can hold in one’s hand. Reuters sells blips on a screen. Presiding over this 1.8 billion pound ($2.7 billion) enterprise as managing director and CEO is British-born Peter Job, 52, a 31-year veteran of a news company founded by Paul Julius Reuter, an emigre German Jew, in 1851. Job began his career as a journalist serving in various posts including India, Malaysia, Indonesia, and the UK. He was named managing director of Reuters’ Asian operations in 1988 and became an executive member of the board in 1989. 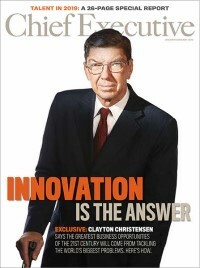 He succeeded GlenRenfrew as CEO two years later. When Job took over, some reckoned Reuters to be a plodder (albeit a profitable one) in a mature industry. Information products such as data for foreign-exchange dealers, a major cash generator, appeared threatened by recession. And gaining market share were two aggressive rivals: Dow Jones’ Telerate and, in the fixed-income market, Bloomberg Financial Services. Yet the company has cash 450 million, despite a 351 million share repurchase scheme last year. With this pile, Job aims to be to financial markets the multimedia provider Bell Atlantic and TCI had hoped to be to entertainment and telecoms. In January, Reuters announced plans to acquire Quotron, the money-losing data services business owned by Citicorp. Job reckons Reuters’ infrastructure and services network can revive the business and give the London-based group a larger presence in North American equity markets. (The US. now overshadows the City of London as its single biggest market.) Earlier, Reuters paid $125.1 million for Berkeley, CA-based systems integrator Teknekron Communications Systems. At the same time, it took a $3 million minority stake in Ad Value Media, a private New York firm that markets transactions services to ad agencies and sales and media outlets. In 1992, the company consolidated its ownership of Reuters Television (formerly Visnews), an international news agency. Other new business moves include the acquisition of a full or controlling interest in Loan Pricing Corp., Vamp Health Ltd., and Reality Technologies. Remember when travel agents found it so easy to work with American Airlines’ Sabre Reservation System that they began booking customers on American rather than on other carriers? Effectively, the airlines had become a market maker in information. Reuters is nearing that point, as well. The success of its Instinet, a computerized share-trading system, and the introduction of Dealing 2000-2, a matching system for foreign-exchange markets, has prompted worry that Reuters is pursuing a technological end run around traditional exchanges. (Never mind the lost commissions to exchange traders.) In the following interview at Reuters’ Fleet Street headquarters, Job dismisses any intent to disintermediate its customers. This hasn’t stopped some U.S. banks from dropping Reuters’ systems in favor of developing their own. They’ll have to hurry. Instinct revenues have nearly doubled to 1120 million in 1993 from 161 million in 1992. Wriston was once quoted as saying, “The information business could easily rival any of our banking businesses as a profit generator in the 1990s.” That’s some blip on the screen. Banks, insurance companies, and manufacturers have become increasingly dependent on information and its uses. Since Reuters provides information to these businesses, why doesn’t it simply offer their services as well? That gives you a new business to run. It means you have to learn about insurance, administration, and training. It’s a hell of a good opportunity-and a big headache. The alternative is to improve companies’ decision-making capabilities so they can improve their profits and performance and service, which leaves a vast number of insurance companies eager to buy Reuters’ services. We don’t want to compete for insurance companies’ clients. We prefer to focus on enabling businesses to sharpen their pikestaffs through the use of information. Once we have licked that problem in one company, we can expand to an entire sector, and then eventually to Ltd., and Reality Technologies. other sectors. That means greater profits. Reuters collects, sifts, and packages volatile information for the needs of particular users acting under time pressure with significant risk exposure. Think of a huge web that spreads all over the world. The slightest touch at the outer edge of this web-the news-sends a tremor back to the middle. Our job is to process it and send it back out to the edges. Many companies in the medical field now try to anticipate outcomes based on expert systems. Is this an emerging core competency of the information technology industry? Perhaps. But you need to think carefully before you say an expert system can predict the future. More precisely, it helps to control risk, analyzing factors to arrive at an informed judgment about a problem or situation. Our recent studies indicate that many brokerages don’t understand how their risk changes during a contract period. We feel that if we give them the right analysis, they will see that at certain points in time, the risk is much greater than they thought, and at other points, it’s much less. Armed with this information, they can tailor their strategies. We provide companies with information. We don’t tell them what to trade in or which horse is going to win the race. Attempting to predict the future would be inconsistent with our role as an information provider. Is there a conflict between Reuters as a traditional newsgathering service and Reuters as an informational provider? If such a conflict existed, we would have faced it years ago, though there is one wrinkle to your question. The debate that rages today is whether you should report a rumor in the market. Rumors generate market liquidity: Everybody loves seeing them on the screen. Generally we do not report rumors, because that compromises our reputation as a source of facts. What are the new frontiers in information technology for Reuters over the next 10 years? Multimedia is one, though I need to define the term carefully. People talk about multimedia as if it were a complete, self-contained product. But it’s nothing without a delivery system. It’s almost like somebody in the Middle Ages saying, “I have gun powder.” And everybody responds, “Yes, but do you have any guns?” We all know in the back of our minds that multimedia is going to change our lives, but we still haven’t worked out how. Let’s return to the spider’s web rattled by movement. That movement is a piece of news. Then there’s the channel that 4 gets it to the subscriber. Next comes the display. The aim is for that web to cover 120 countries and everything that moves-something in the realm of 850 changes a second. This is not an easy feat to accomplish, and one few companies will attempt. Our base financial business is another interesting prairie. There is limitless ability to roll out new technology there, because financial people are usually the most technology aware. Our acquisition of Reality Technologies will allow Reuters to provide software and online service to personal investors. We’re not too bullish on spending large sums of money to give consumers general news, because we wonder how much they will pay for it. But we are expanding our capability to provide personal financial information, because we believe the return on our investment will be greater. Many companies have failed to make money on consumer financial products. Why do you think your effort will succeed? We’re not spending huge amounts of money on this area. But we’re going to try it in the U.S., because some of the American companies we work with have first-class, motivated people who keep a stake in the business. If anybody is going to make things work, these guys will. That’s why most of our slightly more experimental things are taking place in the States. America has developed competitiveness in the basic infrastructure costs, while Europe is hobbled by monopolies. The other reason we’re focusing on the U.S. goes back to the history of the financial services business. Putting information on computer screens was an American invention in the 1960s. Our original technology came through a relationship with a company called Ultronics. Our collaboration with it was rather like an impoverished duchess in 1900 marrying into an American millionaire’s family for the convenience of both parties. Reuters had the name and a good tradition of neutrality and impartiality in news, but it didn’t have any money. So we launched a partnership with Ultronics and took its technology international. Eventually, we didn’t need partners any more. In the meantime, the American players stayed in the U.S. market and steadily crushed one another. We blossomed by operating in the wider, international market. Today, however, U.S. companies aren’t nearly so parochial. They now realize the global scope of the knowledge business. Traditionally, Reuters’ primary competition has been giant information services companies, such as Dow Jones. Do you have any on-traditional competitors, smaller companies, for example, or technology firms that provide services similar to Reuters’ or that aim to disintermediate their customers? I don’t see one. Does that mean I’m blind or does that mean that there isn’t one? People keep talking about this elusive animal. I don’t even see the tips of its ears over the corn. It will be just as difficult, time-consuming, and expensive for other companies to disintermediate as it would be for Reuters to do so. Reuters gets maximum use out of its information by selling to a wide range of companies. I don’t think the publishing business is about disintermediating people by stealing their clients. What about financial information services upstart Bloomberg LP? Bloomberg has a finely tuned, fast-working integrated data base that makes good use of technology, including analytic software programs. It has expanded steadily over time. That presents us with several challenges. We’re busily trying to come up to speed with large-scale computer storage, mastery of relational data base techniques, and acquisition and purification of large amounts of data. It will take time to get to the same point as Bloomberg. And it’s not slowing down to wait for us. Let’s talk about Globex, the global after-hours electronic futures and trading system you created in a joint venture with the Chicago Mercantile Exchange and the Chicago Board of Trade. Is the market sufficiently global to make this system profitable? I can best answer the question by separating what we do in money and what we do in futures. In foreign exchange, there is no fixed floor, and, therefore, when we launched dealing and transactions systems in this area-either of the type where you communicate with somebody electronically or where you’re directly matched with a corresponding seller or buyer we took a shot at the whole market. Since it was all non-material, we could operate that system all the time. With futures, we have more limited prospects for success and profit, because there are physical floors. So we were only going to be able to offer a service in between the chinks of the physical floors. That diminishes the scope of the market. Still, we haven’t abandoned the idea that these chinks can offer enough room for an electronic trading service. There’s increasing interest in bypassing traditional exchanges with so-called fourth market, or direct, trading. Will exchanges become obsolete, and will Reuters play a role in making them so? I don’t think we have the power to do that, but you make a good point. In the U.S., people tend to back away from the established exchanges, because they don’t want to be committed for their entire business to the specialist system of the New York Stock Exchange, for example. They want other trading outlets. Clearly, the development of electronics offers that. Eventually, we probably will see the emergence of electronic brokers, not electronic exchanges. Reuters has an agreement pending to acquire Citicorp’s Quotron stock information system, even though the number of its subscribers has dropped from over 80,000 when Citicorp acquired it in 1986 to 48,000 today. That deal doesn’t bring you any new technology, so what do you get out of it? It’s expansion by acquisition: Even if it brings only 35,000 screens, it would take a long time to sell that number ourselves. The transaction also fills some gaps: We’re actually quite strong in equities, but lagging in other areas. Are you going to replace Quotron’s technology with your own? Not all of Quotron’s technology is old. The system has an application for the retail brokerage market, which fits into our PC advantage. So we don’t have to throw everything away. But we should be able to add bits and pieces over the next few years that will help to re-organize the net work. It will not take us forever to make an impact on this operation, but we’re not starry-eyed either. We know the depth of the problem. Does your acquisition of Teknekron Communications Systems, a Californian software supplier and systems integrator, mean you will be devoting more resources to software development? We are ratcheting up our development expenditure all the time. Life is a desperate race to develop new products. Thus, nothing relieves a company of its responsibility to conquer new technology. Teknekron’s technology is certainly leading-edge, but we don’t want to integrate its operations into Reuters. We want it to focus on research and innovation. In our overall approach to R&D, a large development group controls the infrastructure and also develops the basic platforms on which we move ahead. But where we can, we prefer to keep smaller groups in which we have a stake, with some interest left in the hands of the management. With all your acquisitions, people must be working on a variety of projects. How do you determine which ones are worth nurturing? I’m rather laissez-faire about this in that we don’t have across-the-board criteria. I believe in analyzing skills but not in sweeping strategies or vision statements. The problem is that if you formulate a vision, conditions change, and your statement becomes outdated. That confuses everybody. You shouldn’t have a strategy unless you’re not going change it for 10 or 12 years. That’s how long it will take to realize it. Our strategy today is what we think today, and tomorrow it will be what we think tomorrow. We change our minds. We change direction. We’re flexible. That’s the key. If someone is not doing well on a project, we may change the person in charge of it. But we’re trying to move away from being a top-down company. In the intelligence business, the rate of change is too fast, and hierarchies are unworkable. That’s because the people closest to the customer are usually those in touch with the latest fads, not executives four levels up. We must trust the people down in the structure to tell us what to do. That way we get results.